One of the real pleasures I’ve had as an analyst (thanks to Tracy in our PR department) is the opportunity to meet many of the journalists and reporters in the tech industry. Yesterday, I had the privilege to meet the tech reporters Verne Kopytoff and Ellen Lee who contributes tothe Tech Chronicles blog of the SF Chronicle that are covering technology and social computing. This landmark building, near the Metreon, SF Shopping center and Moscone was an impressive building to see. Below, you’ll see the stained glass windows paying homage to the Gutenberg printing press, the letters on the ceiling in the main foyer, and the ever present TV stations. 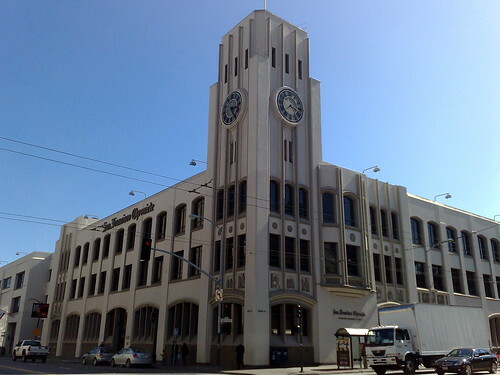 Today, I’m off to UC Berkeley to speak to the Journalism School on the impacts of social networking on news, I’ll be sharing that the SF Chronicle’s comments often get up to 80 comments per article, a unique way how the audience starts to participate.